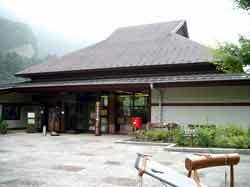 The Yama no Furusato Mura Visitor Center is located on the south bank of Lake Okutama, along Saiguchi Stream. The visitor center is staffed by Nature Interpreters (nature guides), who provide a variety of information and conduct nature experience programs (such as guided walks) every day. Inside the visitor center, a variety of exhibits introduce the nature, culture, and history of the surrounding area. Inside the visitor center, our Nature Interpreters introduce visitors to the nature, culture, and history of the surrounding area by using handmade, hands-on exhibits and videos. Our Nature Interpreters introduce visitors to the nature of Yama no Furusato Mura, and help everyone to enjoy the time they spend in nature. Kids can make their own original crafts by using natural materials. These crafts make perfect souvenirs of Yama no Furusato Mura! Visitors can view multi-image slide shows introducing seasonal nature and ways to enjoy nature. Camps based around seasonal nature themes. The general public is welcome to participate in these camps, where you can learn how to camp in nature and come to understand the joy of nature. Walking courses that you can enjoy at your own pace within the park. Pamphlets for these self-guided hikes include many perspectives from which you can enjoy nature. For elementary school students. Students who register and participate in this nature experience program can receive a certificate and a badge. Explore the nighttime nature of the park together with our guides. You can experience being outdoors in the darkness, and enjoy activities such as animal watching and stargazing. Together with our guides, you can explore a unique side of nature only visible in the morning. We can prepare special programs for large groups upon request. Please contact use for more details.